Laverne John Stoddard was born on 16 July 1908 at Wisconsin. He was the son of Leonard Franklin Stoddard and Anna Regina Byrne. 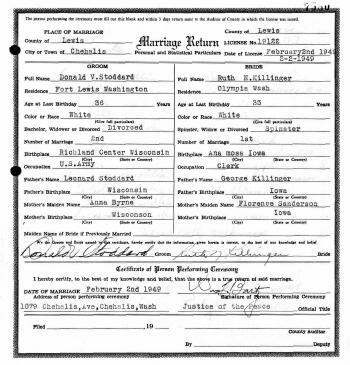 Laverne John Stoddard married Gwen L. Johnson, daughter of Harry Johnson and Lena Belle Brewer, on 23 January 1932. Laverne John Stoddard died on 11 December 1987 at Richland, Wisconsin, at age 79 LaVerne John Stoddard obituary. [S244] U.S. Federal Census 1910 U.S. Federal Census, by Ancestry.com, ED103. Dwelling 65. [S243] U.S. Federal Census 1920 U.S. Federal Census, by Ancestry.com, ED209. Dwelling 133. [S250] U.S. Federal Census 1930 U.S. Federal Census, by Ancestry.com, ED52-23. Dwelling 84. [S373] U.S. Federal Census 1940 U.S. Federal Census, by Ancestry.com, Year: 1940; Census Place: Richland Center, Richland, Wisconsin; Roll: T627_4518; Page: 16B; Enumeration District: 52-17A. 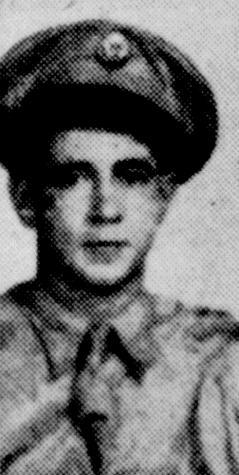 Donald Vincent Stoddard was born on 29 February 1912 at Willow, Richland, Wisconsin, also reported as 28 Feb 1912. Donald Vincent Stoddard married Violet Angeline Nachreiner, daughter of Leo Henry Nachreiner and Gladys Elizabeth Hemberger, circa 1934. Donald Vincent Stoddard and Violet Angeline Nachreiner were divorced circa 1941. 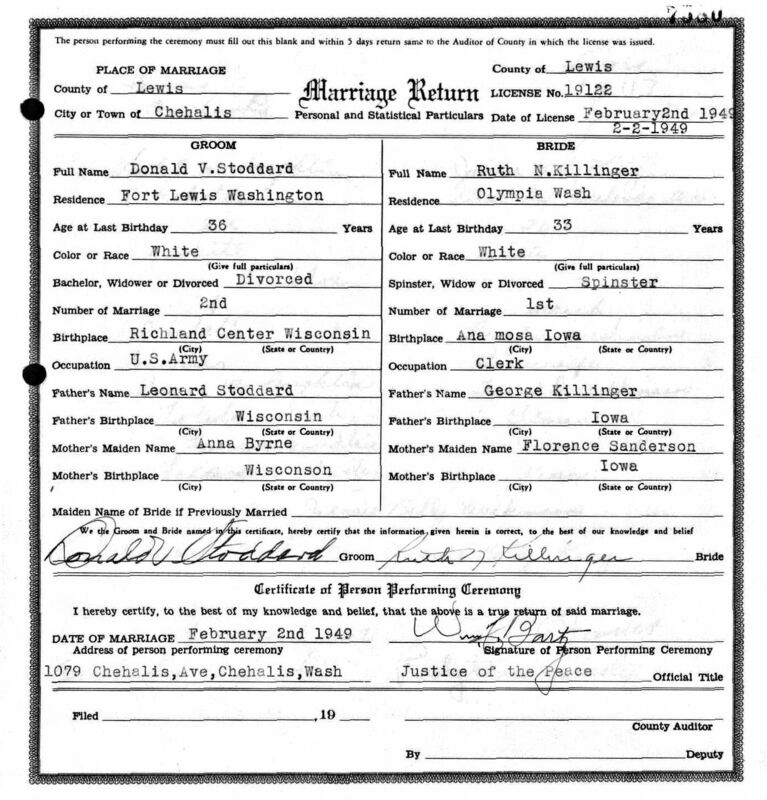 Donald Vincent Stoddard married Ruth N. Killinger, daughter of George Killinger and Florence Sanderson, on 2 February 1949 at he is listed as divorced; she is spinster, Lewis, Washington. Donald Vincent Stoddard died on 19 October 1969 at in a car accident, Albuquerque, New Mexico, at age 57 Donald Stoddard obituary. He was buried after 19 October 1969 at Saint Marys Catholic Church Cemetery, Richland Center, Richland, Wisconsin. Weight: 130. In May 1943 at North Africa Stoddard brothers hold a reunion in North Africa. [S373] U.S. Federal Census 1940 U.S. Federal Census, by Ancestry.com, Year: 1940; Census Place: Ithaca, Richland, Wisconsin; Roll: m-t0627-04518; Page: 10A; Enumeration District: 52-9. Nickname Leonard Paul Stoddard also went by the name of Toad. 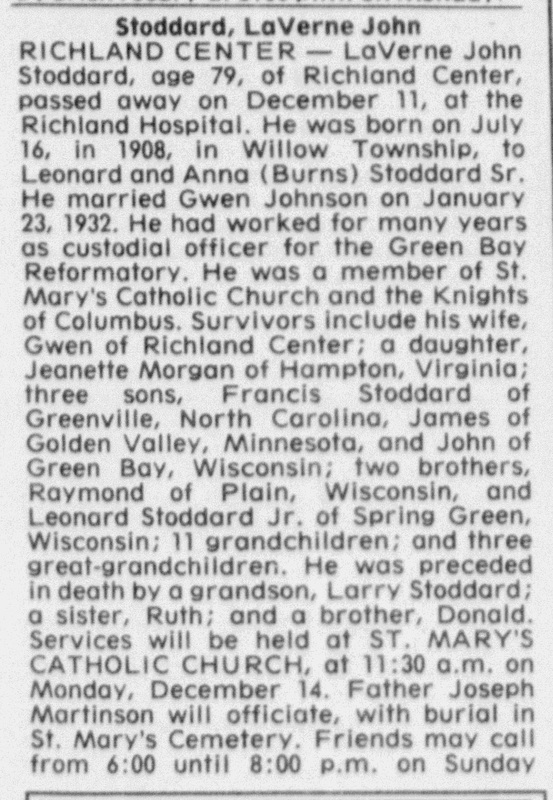 Leonard Paul Stoddard was born on 14 April 1917 at Wisconsin. Leonard Paul Stoddard married Edith Grace Swenink, daughter of Edwin G. Swenink and Susie Florence Drought, on 25 June 1946. Leonard Paul Stoddard married Pluma G. Huffman on 19 February 1966 also reported as 16 Feb 1966. 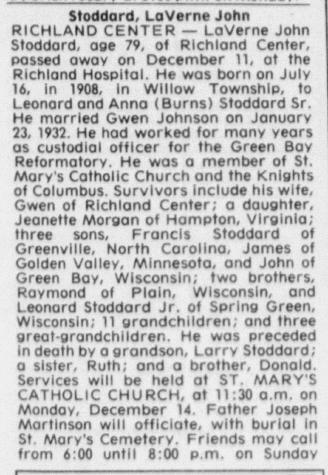 Leonard Paul Stoddard died on 22 October 1998 at Richland, Wisconsin, at age 81 Leonard Paul Stoddard obituary. He was buried after 22 October 1998 at Saint Marys Catholic Church Cemetery, Richland Center, Richland, Wisconsin. In May 1943 at North Africa Stoddard brothers hold a reunion in North Africa. 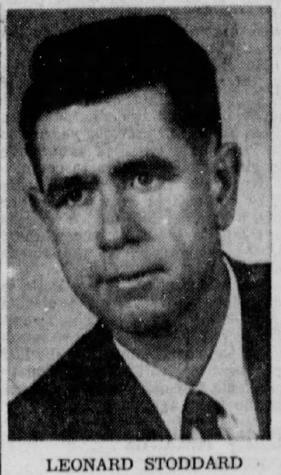 On 28 January 1953 Lenoard Stoddard, 35, has been appointed supervising teacher for Vernon County. [S373] U.S. Federal Census 1940 U.S. Federal Census, by Ancestry.com, Year: 1940; Census Place: Ithaca, Richland, Wisconsin; Roll: T627_4518; Page: 10B; Enumeration District: 52-9. Winifred L. Stoddard was born circa April 1919 at Wisconsin. She was the daughter of Loren Scott Stoddard and Beryl Claudia Gray. [S243] U.S. Federal Census 1920 U.S. Federal Census, by Ancestry.com, ED209. Dwelling 139. [S250] U.S. Federal Census 1930 U.S. Federal Census, by Ancestry.com, ED52-23. Dwelling 79. Married Name Her married name was Stoddard. Amy M. (?) was born in June 1871 at Wisconsin. She married Frank Stoddard, son of Valentine Stoddard and Rebecca Arminda Sippy, circa 1896. [S245] U.S. Federal Census 1900 U.S. Federal Census, by Ancestry.com, ED124. Dwelling 152. [S244] U.S. Federal Census 1910 U.S. Federal Census, by Ancestry.com, ED103. Dwelling 74. Maud M. Stoddard was born in October 1897 at Wisconsin. She was the daughter of Frank Stoddard and Amy M. (?). Married Name Her married name was Martin. Georgia Stoddard married Harley Martin. Georgia Stoddard was born in January 1880 at Wisconsin. She was the daughter of Harlow Franklin Stoddard and Anna J. Reagles. [S245] U.S. Federal Census 1900 U.S. Federal Census, by Ancestry.com, ED124. Dwelling 155. Married Name Her married name was Laughlin. Dorothy Wheeler married (?) Laughlin. Dorothy Wheeler was born circa 1918 at Wisconsin. She was the daughter of Guy Wheeler and Blanche Harriet Dorow. Dorothy Wheeler lived in 1976 at Darien, Illinois. [S243] U.S. Federal Census 1920 U.S. Federal Census, by Ancestry.com, ED168. Dwelling 22. [S250] U.S. Federal Census 1930 U.S. Federal Census, by Ancestry.com, ED56-17. Dwelling 80. Name Variation Blakeslee Guy Wheeler was also known as Blakesley. Blakeslee Guy Wheeler was born on 18 December 1918 at Wisconsin. He was the son of Guy Wheeler and Blanche Harriet Dorow. Blakeslee Guy Wheeler died on 24 August 2006 at age 87. Blakeslee Guy Wheeler graduated in 1935 at Reedsburg High School, Reedsburg, Sauk, Wisconsin. Evan L. Wheeler was born on 21 February 1921 at Wisconsin. Evan L. Wheeler married Lorna Mae Lueders, daughter of Albert Fred Lueders and Rose M. Springbrunn, on 9 April 1944 at Reedsburg, Sauk, Wisconsin, Lorna Lueders and Evan Wheeler marriage announcement. Evan L. Wheeler died on 24 October 2007 at age 86. 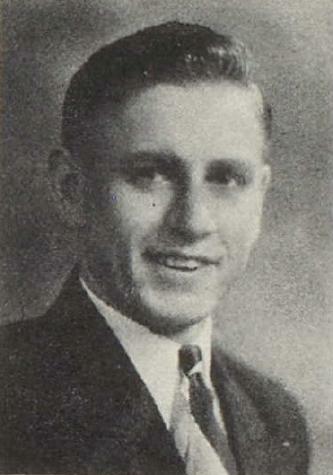 Evan L. Wheeler graduated in 1940 at Reedsburg High School, Reedsburg, Sauk, Wisconsin. Married Name Her married name was Phelan. Name Variation Anna Roessler was also known as Anne. Name Variation Anna Roessler was also known as Annie. Anna Roessler married William Phelan, son of Dennis Phelan and Elizabeth Quinn. Anna Roessler was born on 20 December 1895 at Wisconsin. Anna Roessler died in December 1966. Anna Roessler obtained US Social Security Card at Wisconsin; last residence Madison, Dane, Wisconsin. She lived in 1926 at Chicago, Cook, Illinois. [S245] U.S. Federal Census 1900 U.S. Federal Census, by Ancestry.com, ED129. Dwelling 75. Name Variation Anthony James Roessler was also known as Antony James. Anthony James Roessler was born on 2 February 1894 at Plain, Sauk, Wisconsin, also reported as 2 Feb 1893. He was the son of Wenzel L. Roessler and Anna Rose Honish. Anthony James Roessler married Apollonia G. Schmitz, daughter of (?) Schmitz, on 28 February 1922. Anthony James Roessler died on 1 November 1977 at St.Mary's Hospital, Madison, Dane, Wisconsin, at age 83 also reported as 31 Oct 1977. ROESSLER, ANTHONY J., Sandusky, Wis. Inducted July 22, 1918, Sauk Co; served as private, 161st Dep. Brig; Co. I, 343d Inf; Co. C, 109th Inf; arrived in Europe Sept. 14, 1918; sailed for America May 3, 1919; mustered out May 20, 1919. Anthony James Roessler obtained US Social Security Card at Minnesota; last residence Madison, Dane, Wisconsin. He lived in 1926 at Bear Creek, Sauk, Wisconsin. He lived in 1948 at Plain, Sauk, Wisconsin. On 27 February 1972 Anthony and Apollonia (Schmitz) Roessler 50th wedding anniversary celebration. [S250] U.S. Federal Census 1930 U.S. Federal Census, by Ancestry.com, ED56-8. Dwelling 106. Name Variation Joseph Gilbert Roessler was also known as Joe. Joseph Gilbert Roessler was born on 17 December 1891 at Wisconsin also reported as Dec 1892. Joseph Gilbert Roessler died on 13 February 1969 at Rice, Wisconsin, at age 77. ROESSLER, JOSEPH G., Sandusky. Inducted July 15, 1918, Baraboo; served as private, Camp Hancock, Ga; Co. D, 35th M.G. Bn; mustered out Feb. 7, 1919. Joseph Gilbert Roessler obtained US Social Security Card at Wisconsin; last residence Plain, Sauk, Wisconsin. He lived in 1926 at Chicago, Cook, Illinois. He lived in 1948 at Plain, Sauk, Wisconsin. [S250] U.S. Federal Census 1930 U.S. Federal Census, by Ancestry.com, ED56-8. Dwelling 138. Name Variation Adolph Roessler was also known as Adolf. Adolph Roessler was born on 12 April 1886 at Wisconsin also reported as April 1887. Adolph Roessler married Genevieve McCarville, daughter of Francis McCarville and Julia Farley, circa 1918. Adolph Roessler died in 1967. Adolph Roessler lived in 1926 at Black Hawk, Sauk, Wisconsin. He lived in 1948 at Sauk City, Sauk, Wisconsin. [S243] U.S. Federal Census 1920 U.S. Federal Census, by Ancestry.com, ED160. Dwelling 54. [S250] U.S. Federal Census 1930 U.S. Federal Census, by Ancestry.com, ED56-37. Dwelling 192. 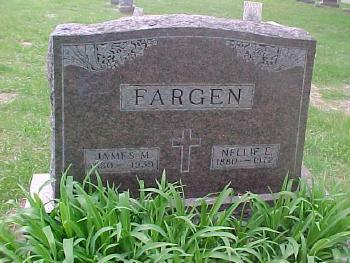 Name Variation Martin Fargen was also known as Fargin. Martin Fargen was born in November 1826 at Ireland. He was the son of Henry Fargen and Bridget (?). Martin Fargen married Mary King on 12 April 1873. Martin Fargen died on 3 February 1901 at age 74. He was buried after 3 February 1901 at Our Lady of the Fields, Loreto, Old Chapel, Old St. Patrick's, Bear Creek, Sauk, Wisconsin. Martin Fargen immigrated in 1855. 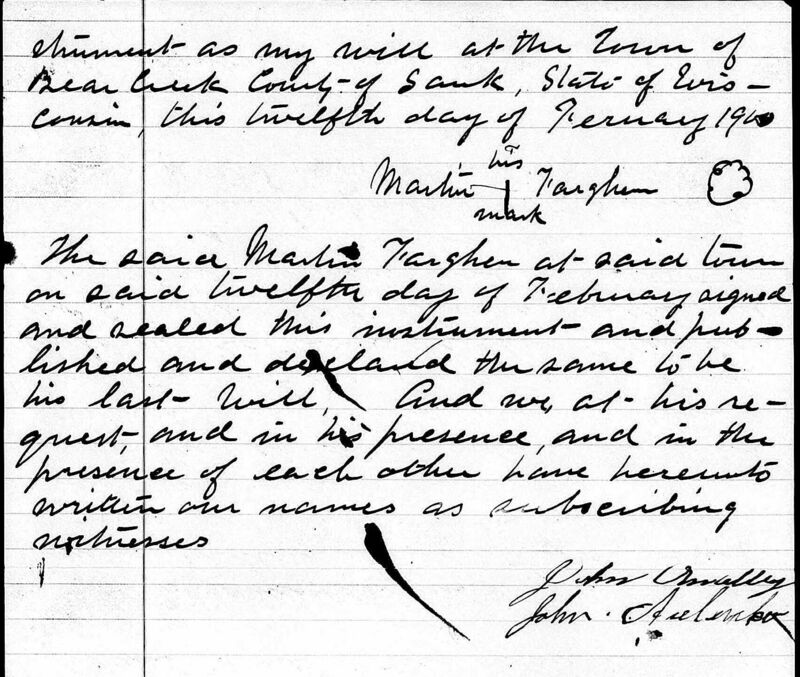 He left a will on 12 February 1900 at Sauk, Wisconsin. [S248] U.S. Federal Census 1860 U.S. Federal Census, by Ancestry.com, Page 144. Dwelling 1095. 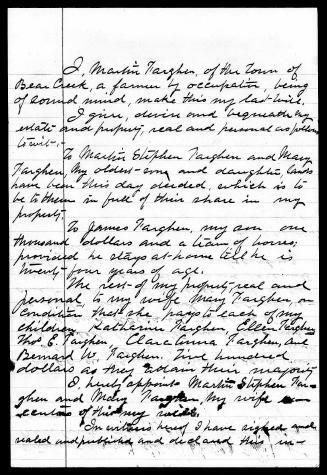 [S247] U.S. Federal Census 1870 U.S. Federal Census, by Ancestry.com, Page 13. Dwelling 97. 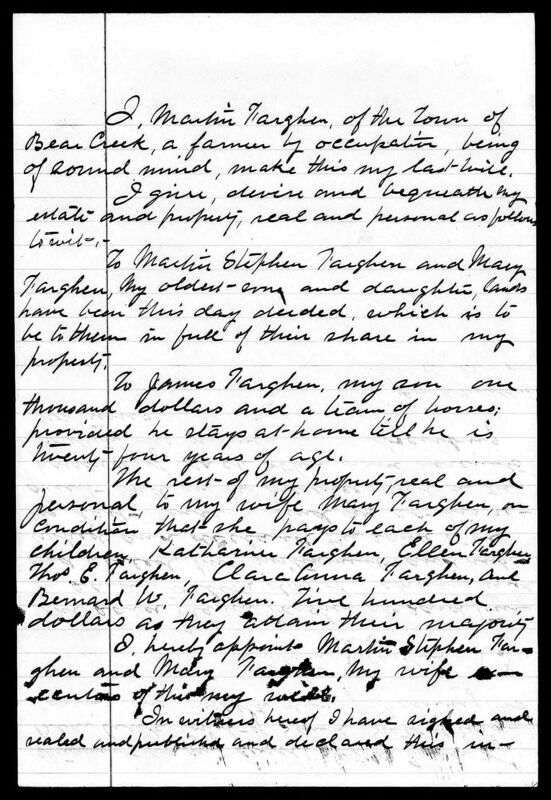 [S246] U.S. Federal Census 1880 U.S. Federal Census, by Ancestry.com, NA Film Number T9-1446 Page Number 52A. Listed as Martin FARDGEN. [S245] U.S. Federal Census 1900 U.S. Federal Census, by Ancestry.com, ED129. Dwelling 105. Married Name 12 April 1873 As of 12 April 1873,her married name was Fargin. Married Name 12 April 1873 As of 12 April 1873,her married name was Fargen. 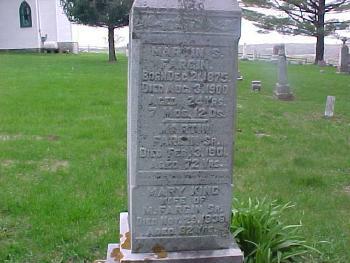 Mary King was born in May 1855 at Wisconsin. She married Martin Fargen, son of Henry Fargen and Bridget (? 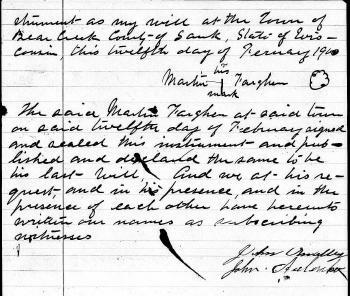 ), on 12 April 1873. Mary King died on 29 November 1936 at age 81. Mary King had 9 with 8 living in 1900 children. [S180] Wisconsin Sauk Co Cemetery Records Vol 6, page 5. [S243] U.S. Federal Census 1920 U.S. Federal Census, by Ancestry.com, ED160. Dwelling 16. [S250] U.S. Federal Census 1930 U.S. Federal Census, by Ancestry.com, ED56-8. Dwelling 151. 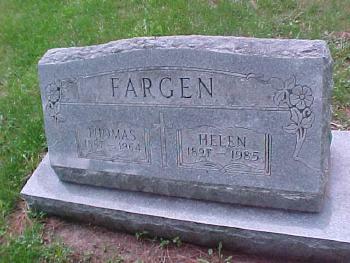 Mary Fargen was born in January 1874 at Wisconsin. She was the daughter of Martin Fargen and Mary King. 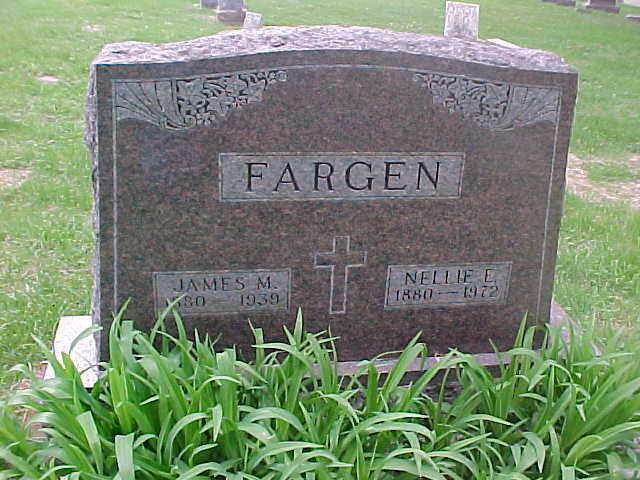 James Michael Fargen was born on 15 April 1880 at Wisconsin. He was the son of Martin Fargen and Mary King. James Michael Fargen married Nellie E. Dorgan, daughter of Lawrence W. Dorgan and Mary Killoy, circa 1904. James Michael Fargen died in 1939. [S250] U.S. Federal Census 1930 U.S. Federal Census, by Ancestry.com, ED56-8. Dwelling 153. Thomas Edward Fargen was born on 22 June 1887 at Wisconsin also reported as 23 Jun 1887. Thomas Edward Fargen married Helen Byrne, daughter of James S. Byrne and Anna Lahan, circa 1919. Thomas Edward Fargen died on 17 January 1964 at age 76 Thomas Fargen, 76, lifetime resident of Bar Valley, died Friday (17 Jan 1964) at his farm home after a long illness. Funeral services were held Monday forenoon at St. Mary's Catholic Church at Keyesville with Father William Jablonske officiating. Burial was in the Loreto Chapel cemetery. The rosary was recited Sunday evening at the Lunenschloss-Hansen chapel. 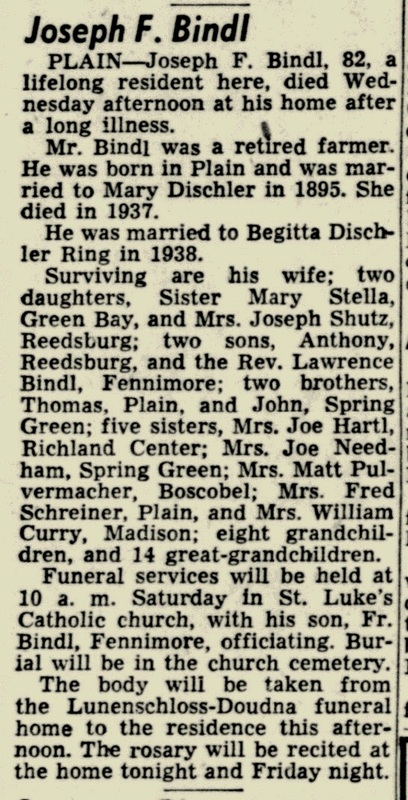 Mr. Fargen is survived by his wife, the former Helen Byrne; two daughters, Mrs. William Dolan, Beloit, and Mrs. Lawrence Dumphy, Albany; four sons, Thomas, Jr., Martin, William and John, all of Bear Valley; a sister Mrs. William Mears, Hillpoint, and 32 grandchildren Spring Green Home News, 23 Jan 1964.
improved a large part of the land. Martin Fargen passed away in 1901. Ellen; Tho.mas; Clara; and Bernard. [S250] U.S. Federal Census 1930 U.S. Federal Census, by Ancestry.com, ED56-8. Dwelling 150. Bernard William Fargen was born on 15 September 1894 at Wisconsin also reported as 14 Sep 1895. Bernard William Fargen died in April 1954 at age 59. Bernard William Fargen obtained US Social Security Card at Wisconsin; last residence not specified. Francis H. Letcher was born in September 1878 at Wisconsin. He married Lucille M. Cass, daughter of George Washington Cass and Margaret Jane Beaver, circa 1899. [S245] U.S. Federal Census 1900 U.S. Federal Census, by Ancestry.com, ED145. Dwelling 37. [S244] U.S. Federal Census 1910 U.S. Federal Census, by Ancestry.com, Year: 1910; Census Place: Spring Green, Sauk, Wisconsin; Roll: T624_1737; Page: 9B; Enumeration District: 0126; FHL microfilm: 1375750. Name Variation Marcia Letcher was also known as Gwendoline. Marcia Letcher was born in December 1899 at Wisconsin. She was the daughter of Francis H. Letcher and Lucille M. Cass. Name Variation Eleanore Amelia Kremer was also known as Elnora. Name Variation Eleanore Amelia Kremer was also known as Eleanor A. Married Name circa 1896 As of circa 1896,her married name was Cass. Eleanore Amelia Kremer was born in August 1869 at Wisconsin. She married Francis J. Cass, son of George Washington Cass and Margaret Jane Beaver, circa 1896. Eleanore Amelia Kremer had 2 with 2 living in 1910 children. [S245] U.S. Federal Census 1900 U.S. Federal Census, by Ancestry.com, ED145. Dwelling 36. [S244] U.S. Federal Census 1910 U.S. Federal Census, by Ancestry.com, ED126. Dwelling 28. [S250] U.S. Federal Census 1930 U.S. Federal Census, by Ancestry.com, ED56-34. Dwelling 62. Name Variation Glen W. Cass was also known as Glenn. Glen W. Cass was born in January 1897 at Wisconsin. He was the son of Francis J. Cass and Eleanore Amelia Kremer. Glen W. Cass married Ella (?) circa 1920. Married Name 11 September 1878 As of 11 September 1878,her married name was Cass. Mary Plulean Carter was born on 23 December 1850 at New York. She was the daughter of William Carter and Caroline Blodget. Mary Plulean Carter married Walter Taplin Cass, son of James Milton Cass and Mary Taplin, on 11 September 1878 at his third marraige; her first marrage. Mary Plulean Carter died on 24 May 1920 at age 69. Mary Plulean Carter had 2 with 1 living in 1910 children. [S245] U.S. Federal Census 1900 U.S. Federal Census, by Ancestry.com, ED145. Dwelling 35. [S244] U.S. Federal Census 1910 U.S. Federal Census, by Ancestry.com, ED126. Dwelling 14. Name Variation Anna Bindl was also known as Annie. Married Name 26 February 1906 As of 26 February 1906,her married name was Pulvermacher. Anna Bindl was born on 4 March 1885 at Wisconsin. Anna Bindl married Mathew Pulvermacher, son of Michael Pulvermacher and Agnes Neuheisel, on 26 February 1906. Anna Bindl died on 22 October 1966 at age 81. Anna Bindl had 4 with 4 living in 1910 children. [S244] U.S. Federal Census 1910 U.S. Federal Census, by Ancestry.com, ED110. Dwelling 100. Name Variation Elizabeth M. Bindl was also known as Lizzie. Name Variation Elizabeth M. Bindl was also known as Lizzie M.
Married Name circa 1903 As of circa 1903,her married name was Needham. Elizabeth M. Bindl was born in January 1880 at Wisconsin. Elizabeth M. Bindl married Joseph Edward Needham, son of Lorenzo D. Needham and Margaret Voelkel, circa 1903. Elizabeth M. Bindl died in 1966. Elizabeth M. Bindl had 1 with 1 living in 1910 children. Name Variation Rupert Bindl was also known as Robert. Rupert Bindl was born in November 1879 at Wisconsin tombstone lists birth as 1878. 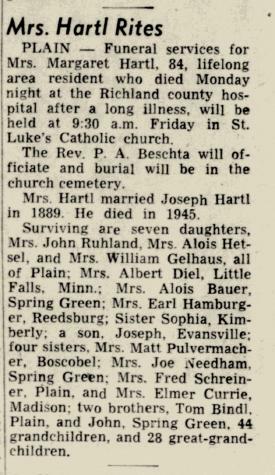 Rupert Bindl married Anna M. Brei, daughter of Michael Brei and Catharine Fellner, on 29 May 1906 at Plain, Sauk, Wisconsin. Rupert Bindl died in 1940. [S243] U.S. Federal Census 1920 U.S. Federal Census, by Ancestry.com, ED164. Dwelling 223. Name Variation Margaret Bindl was also known as Maggie. Married Name 1889 As of 1889,her married name was Hartl. Margaret Bindl was born on 11 April 1868 at Wisconsin. Margaret Bindl married Joseph Hartl, son of Joseph Hartl and Mary (? ), in 1889. Margaret Bindl died on 29 December 1952 at Richland, Wisconsin, at age 84 Margaret (Bindl) Hartl obituary. Margaret Bindl had 4 with 4 living in 1900 children. Name Variation Joseph Frances Bindl was also known as Frances Joseph. Name Variation Joseph Frances Bindl was also known as F. J.
Joseph Frances Bindl was born on 21 January 1871 at Sauk, Wisconsin. 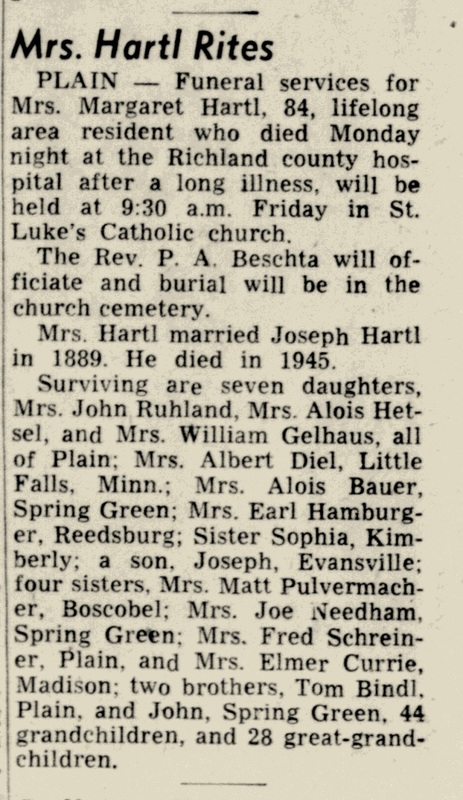 Joseph Frances Bindl married Mary Ann Dischler, daughter of John Baptist Dischler Sr. and Maria Ruhland, on 24 February 1892 at Franklin, Sauk, Wisconsin. 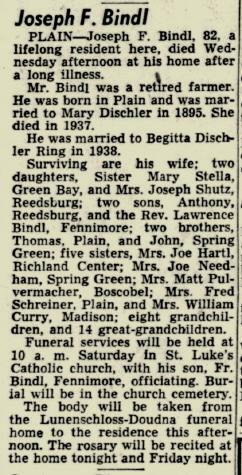 Joseph Frances Bindl married Brigitta M. Dischler, daughter of John Baptist Dischler Sr. and Maria Ruhland, in 1938 at married to sister Mary's husband, after her death, Plain, Sauk, Wisconsin. Joseph Frances Bindl died on 1 October 1952 at Plain, Sauk, Wisconsin, at age 81 Joseph F. Bindl, 82, lifelong resident here, died Wednesday afternoon at his home after a long illness. Mr. Bindl was a retired farmer. He was born in Plain and was married to Mary Dischler in 1895. She died in 1937. He was married to Brigitta Dischler Ring in 1938. Funeral services were held at 10 a.m. Saturday in St. Luke's Catholic church, with his son, Fr. Lawrence Bindl of Fennimore, officiating. Joseph Frances Bindl had 9 with 5 living in 1910 children. [S245] U.S. Federal Census 1900 U.S. Federal Census, by Ancestry.com, ED134. Dwelling 207. [S244] U.S. Federal Census 1910 U.S. Federal Census, by Ancestry.com, ED115. Dwelling 71.